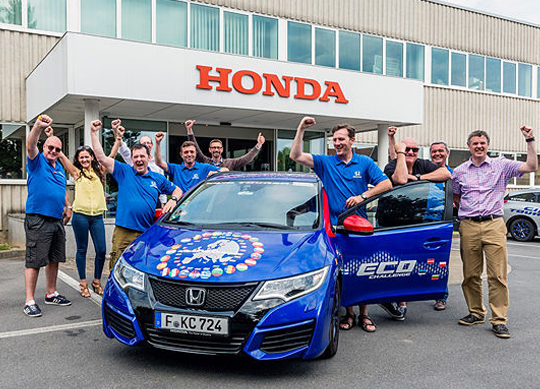 Honda has set a new GUINNESS WORLD RECORDS title for ‘Lowest fuel consumption – all 24 contiguous EU countries (all cars),’ recording an average 2.82 liters per 100km (100.31mpg) over 13,498km (8,387 miles), in a 25 day drive across all 24 EU contiguous countries. The remarkable distance travelled is similar to the team driving to Australia from their home in the UK, stopping just nine times to refuel. The car achieved an incredible average 1500km (932 miles) on each tank of fuel, at a total fuel cost for the whole journey of just 645 Euros* (£459). The team set out on their epic road trip from Aalst, Belgium, on Monday June 1st, navigating the continent in a clockwise direction. They returned to their start point on Thursday June 25th, recording the incredible fuel economy figures which exceed the Tourer’s quoted efficiency of 3.8 liters per 100km (74.3mpg), by more than 25%. The official GUINNESS WORLD RECORDS title is ‘Lowest Fuel Consumption – all 24 contiguous EU countries,’ measured in liters per 100km and miles per gallon calculated over the entire journey. Based on strict and rigorous guidelines, the GUINNESS WORLD RECORDS title attempt required the car to enter each of the 24 countries specified, collecting a range of evidence including a fuel/mileage logbook, GPS readings, video and photographs and independent witness signatures to prove that it has done so. To ensure accurate monitoring of the route, journey time and distance driven, the record car was fitted with a tracking device, provided by fleet telematics and stolen vehicle recovery expert, TRACKER (part of the Tantalum Corporation). Under the rules of the record title attempt the car must be a standard model in every respect, with no modifications to create an advantage, to replicate ‘real world’ conditions. This was judged by independent witnesses at the beginning and end of the attempt. Fueling was carried out at regular filling stations, with the tank filled to the maximum at each stop to ensure no weight advantage. Additionally, tires were inflated to the recommended pressures and the wheel alignment set to factory specification to represent the experience of the regular customer.